I am not an early riser. What’s the thing I’m probably looking forward to most about summer? No alarm clock. I no longer sleep till noon, like I did when I was a teenager, but I wouldn’t really have a problem with it if I did. Every now and then. But every now and then I do manage to roll out of bed early, either with or without the help of that clock, and every now and then I manage to be awake when I do it. And those are the mornings I look around, listen to the quiet inside and the noisy birds outside, and I remember the value of going a bit more slowly. Of not being so much at the beck-and-call of the to-do list, of giving myself the time to use all my senses–including the smell of the morning air on our little mountain and the touch of my fingers on the keyboard. 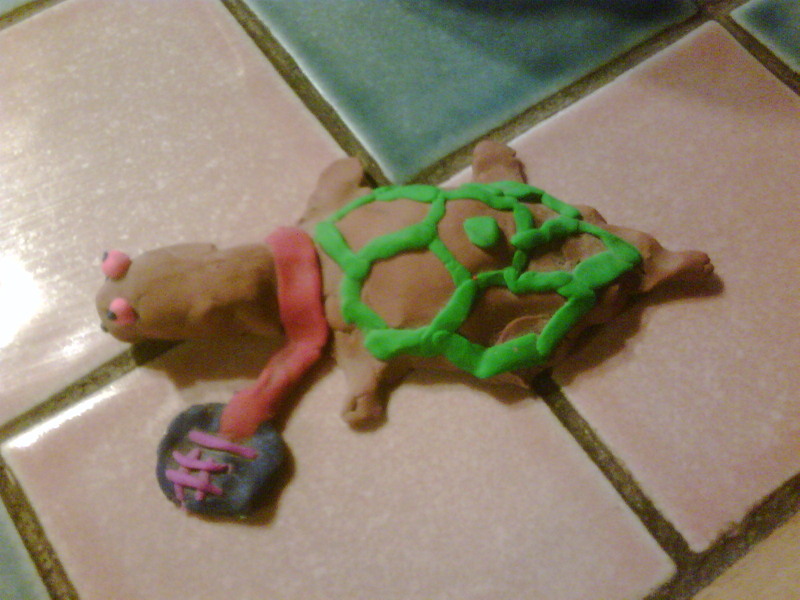 A few years ago, my son made me this turtle. It was one of those times when I was trying to hurry, hurry, hurry through a revision, when the target I had at the end of my scope was labeled “Finish.” When I had schedules and deadlines (all my own) on my mind, even as I was doing the best job I could of reaching deep into my story and figuring out how to make it better. When I was telling myself (and trying to believe) that rushing was not the way to go. Can you see the turtle’s “#1” medal around his neck? Yes, it’s that turtle–the one for whom slow and steady won the race. And, yes, you can take that medal two ways. Or I can. That slow and steady will get me my dream–which, yes, does include more books on bookstore shelves and e-readers, kids who read those books and love them, the time and freedom to keep writing that kind of book. Or you can read that slow and steady is the way to go even if the dream is only about the writing, about making the time to write, even if those other dreams don’t yet have a solid, visible date-stamp on them. These days, I’m working at reading the medal as meaning both things. That the writing is what matters–that the best thing I can do for myself is to write, to remember how much I love the flow of words, and to keep learning ways to make it better. AND that doing this, keeping at it, is the best way I have of making the other dream come true. This weekend was a lot of reading time. This morning, back to my WIP, to an argument between my MC and her (currently) THIRD love-interest. Am I looking forward to it? You bet I am. Happy Monday dreams to everyone. Third love interest? Lucky MC! i love the turtle. How perfect he has a medal on. Enjoy the summer and the race! I am always having to remind myself that it will take as long as it will take. Some stories will unfold quickly and some will take, ahem, years.